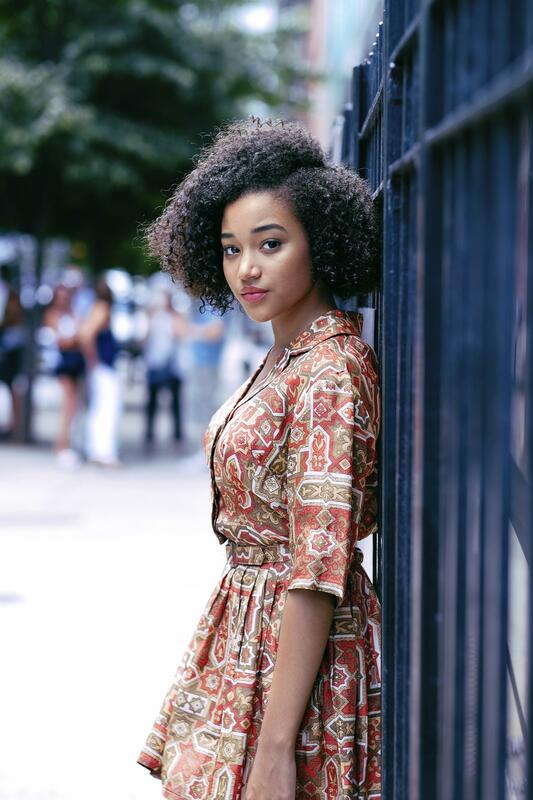 We spoke to Amandla Stenberg, a self-described “feminist since birth,” to find out how she is using her platform to challenge media narratives and to provide a positive model for Black girls everywhere. Amandla Stenberg has something to say. The Hunger Games and Mr. Robinson actress captured our attention back in April when, as part of a class project, she uploaded a YouTube video criticizing White appropriation of Black culture. “What would America be like if it loved Black people as much as it loves Black culture?” the 16-year-old wondered. We spoke to Stenberg, a self-described “feminist since birth,” to find out how she is using her platform to challenge media narratives and to provide a positive model for Black girls everywhere. You’ve been vocal on social media about White celebrities co-opting Black culture. Many praised you for your courage in speaking up, but others didn’t appreciate your message. How did you deal with the backlash? I noticed that whenever I was trying to talk about social justice and how Black women are framed in the media, quite ironically, I would be framed in a certain way that would demonize me and take away the value of my point. That’s a tool that is used repeatedly in the media: Whenever Black women have a point, they’re characterized as Angry Black Women, and therefore the thing they’re talking about is no longer of importance because they have to deal with them being overly emotional or something. I recognize that people who respond negatively to what I have to say aren’t at a place yet where they are able to learn. And I know that that’s not personal. That’s unfortunately a product of society as a whole. And it’s exactly what I’m trying to fight. Did your parents raise you to be socially conscious? My mom is a really powerful artist, creator and writer and a really smart Black woman, so she has always set an example for me and taught me how to express myself through words and other mediums. I feel like when I was younger—even though I may not have been conscious [of it]—I fought my hair and I fought who I was…to try to conform, or shy away from my Blackness. Now that I’m growing older, I find that my source of power comes from my identity and ethnicity. In speaking out about these issues, what do you hope to have happen? My larger goal is to affect and empower more Black girls, because I know how important it has been to me to see representations of myself out there through role models like Ava DuVernay and Laverne Cox and FKA twigs—artists who are inspiring and creative and carefree. Even though the response to what I’ve talked about isn’t always necessarily positive, I’ve thought to myself, Wow, it’s so incredible that we are even having those conversations and that that was my doing. I felt so honored and proud that I could even bring these important things to the forefront. This article was originally published in the October issue of ESSENCE, on newsstands now.